Hiking tips are key, especially if you are a beginner. Some might think it’s as simple as heading out to a national park or state park and following the paths. The problem with that is you could get lost and find yourself in a lot of trouble. It is a good idea to at least prepare a little bit and remember some of these hiking tips. While you might have heard that one trail is AMAZING and you just have to go do it. If you are a beginner you shouldn’t tackle that trail if it’s not an easy one. It is important to learn how to navigate the shorter, easier trails first. The time spend on these trails can help you learn how to understand signs on the pathways, or even how to use the trail map and understanding where you are. We are talking about an important hiking tip here. Wearing the wrong shoes could make what was supposed to be a fun outdoor adventure a painful nightmare. Comfortable hiking shoes and socks will allow you to be comfortable while enjoying the outdoors. Yes, we are always on our phones, even in the great outdoors. Why? Because you did all of that work hiking and navigating to a cool spot, and now you need proof to show your friends on social media. Taking lots of pictures and video and even using the phones GPS can drain a battery quickly. So it is an important hiking tip (if you are using your phone a lot) to bring backup power. The RokPak Pioneer Series is always our suggestion, because it can charge 2 devices at the same time with the massive internal battery. Not only that but it’s waterproof, drop-proof and has a solar panel built right in just in case or to recharge the battery while you hike. That is pretty cool! Always make sure to fill up your water bottles or hydration backpacks before starting a hike. It is also important that you are hydrated before hiking. The last thing you want is to get tired and start cramping up when you are only half way though. If you are going to take any hiking tips away from this article, this should be the one to pay attention to. There are so many more things you should know before hiking. Have fun, meet some new friends and learn from them. Always be aware of your surroundings and respect the rules of the parks. They are not only in place for your safety but to keep the wildlife thriving so that you can continue to go back and enjoy hiking for the years to come. 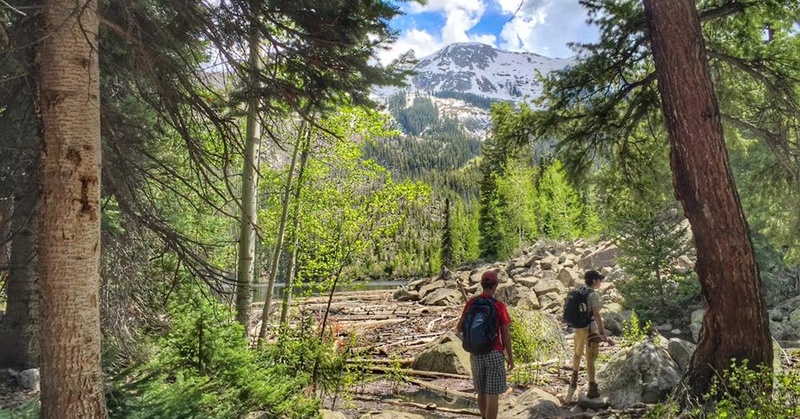 Make sure to share these hiking tips or other hiking tips you may learn with your friends. Try to learn something new every day! Thanks for the good advice. Keep hydrated is really important so bring plenty of water. Bring the 10 essentials (google it) to make sure that your fun hike doesn’t turn into a bad day. Weather changes, injures, getting lost can happen to even an experienced hiker. Most people forget that shoes are that vital. Quality over cost in this situation. Water and more water. Be sure your furry friend is carrying some for him (or her) self also. And have that RokPak with you just in case! Never leave home without it! Any outdoor activity, any outdoor environment, a RokPak solar charger is a must have piece of gear. I’m planning a 300 mile hike. Save your knees and ankles. I hurt my leg early on one trip and the weekend was a walking heck for me. Out of the other portable solar kits I have seen, this is the best one that looks protected from damage. Waterproof solar power and storage? Good I.C.E. gear. RokPaq in Camo colors? Don’t set it down in the woods!